As Goldacre points out, this quote betrays an approach to the study of psych0logical states that has much in common with Descartian dualism; according to this view, our experience of the world is distinct and separate from our physiological response to that experience of the world. In this particular case, the researcher obviously feels that personal experience of low libido is insufficient evidence in itself of any psychological disorder, but the condition becomes ‘true’ when that experience is accompanied by verifiable changes in brain activity. We shouldn’t be too critical of the researcher quoted earlier. He is simply responded to several cultural factors – the need for scientific research to seek objective data that can be publicly observed, the fact that he’s working in a psychosomatic domain where disorders require objective criteria for diagnosis and (in my opinion) an implicit tendency towards the ongoing medicalisation of everyday life (see this earlier Bad Science article for more provocation on that topic). But from the perspective of the individual, does the experience of low libido or a headache or depression require this kind of objective and scientific justification? I would say not, at least for the vast majority, but I do wonder if the widespread adoption of body blogging, pervasive sensors and personal informatics might accelerate a trend towards this kind of objective self-awareness. 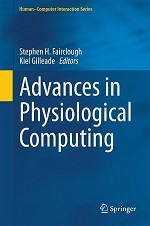 Several writers on this kind of technology (including myself) have argued that physiological computing technology has the potential to enhance self-awareness of the individual, to effectively reduce or ameliorate negative psychological states. This perspective comes from the biofeedback paradigm, i.e. by making unconscious physiological processes visible and open to inspection, we enhance the ability of the individual to self-regulate those processes. In some cases, where self-awareness may be blunted due to fatigue, stress or medical conditions (e.g. Picard’s work on feedback/emotional regulation of autistic children, see press article here), the benefits of this approach are obvious. On the other hand, we should acknowledge that there is also the potential for an amplification of a negative state via a biofeedback display. For instance, if I am annoyed by some real or imagined slight, then I check my physiological response and it’s sky-high, that might make me even more annoyed? “Look what they did to me!” Possibly… Or perhaps with experience, self-regulation would allow me to use the feedback in a more constructive way. However, I do see the real potential for the widespread presence of physiological computing systems to turn us all into Descartian dualists. We will have our experiences (the way we feel) and on the other hand we’ll have a biofeedback display giving another perspective on the self, we have the ‘ego’ that perceives and senses the world and the ‘body’ that provides a mechanical response to the same events. This view of the divided ego may improve self-regulation, simply by permitting some explicit iteration between ego and body, but one wonders if there will be an associated psychological cost with respect to regarding the physiological response of the body as primary or more truthful at some level. This perspective again comes from the medical model that we all have an implicit respect for in Western culture. In my view, users must have an informed perspective on the feedback provided by the system – the feedback is not ‘you’, it is a representation that should augment rather than obscure the process of self-perception. If not, we end up in the same situation as the researcher quoted earlier in this post – looking for objective physiological markers in order to both drive and validate our own experiences and interpretation of the world, always in search of an elusive truth.